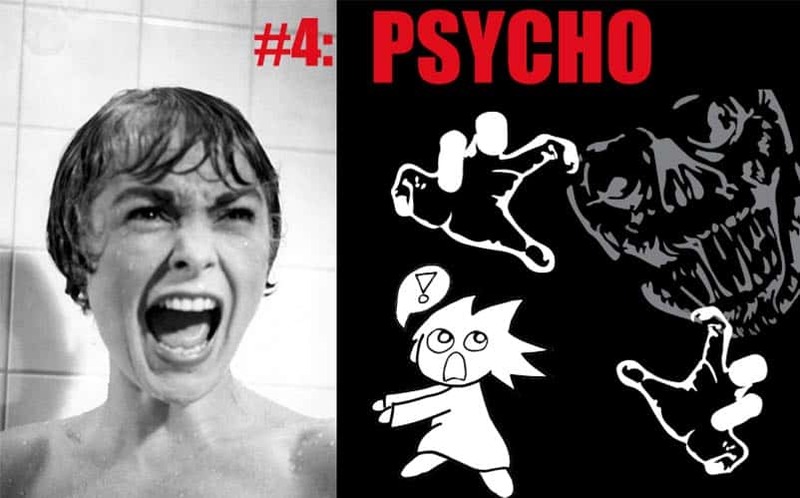 A Crash Course in Horror Movies: Psycho Review | Nerd Much? A Crash Course in Horror is a weekly column by our self-proclaimed horror movie noob, Noémi Pomerleau. Each week, she reviews a classic (or even “new classic”) horror movie from the viewpoint of someone who has never seen it (because, well, she hasn’t). Check out the column every Saturday morning here at Nerd Much. If you’re talking about the most popular horror movies of all time, Psycho’s got to be on the short list. That’s why the Hitchcock film with the infamous shower scene is the subject of this week’s Crash Course in Horror. Other than the shower scene I already mentioned, I knew literally nothing about Psycho. That is the ideal situation to watch this movie in. If you’re lucky enough to be in the same position, I have a word of advice for you before I start the review. If you don’t know what happens in Psycho, even if you THINK you know but you aren’t dead sure, WATCH IT RIGHT NOW. You can read this review later. Read one of my past reviews, if you really want to read a horror movie review right now. Just do yourself a favor and watch it with as little knowledge as possible. Given that it was released in 1960, a lot of people will have seen this movie already, and I am going to spoil a fair portion of it in my Psycho review. If you still have a chance to be surprised by it, take it. Psycho follows the story of Marion Crane (Janet Leigh), a woman who seems to have her life together at the start of the film. She’s working at a job she’s been at for years and is respected and trusted at. She’s dating a guy named Sam (John Gavin) who — other than the fact that he’s got serious money problems — seems like a pretty cool guy. She has a sister (Vera Miles) who cares about her and seems to be close to her. Then for some reason she decides to steal $40,000 from her employer, and everything goes completely wrong. Admittedly, a rich oil baron literally waved it in her face — that’d tempt anybody. Because you’ve seen a movie before, you know that Marion’s going to get punished for this. Actually, if you’ve seen any reference to Psycho ever, you know she gets stabbed to death in the shower. 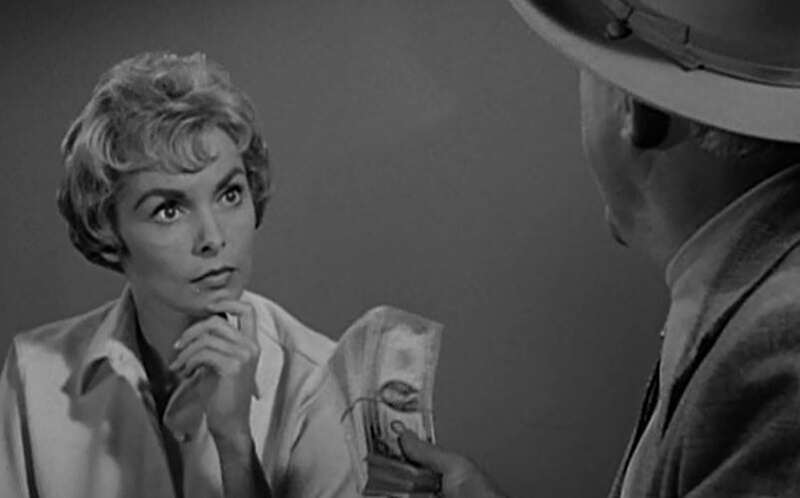 I knew this was coming, but had no idea why, so you can’t blame me for thinking at first that she was probably going to get murdered because Marion Crane is the WORST CRIMINAL EVER. She almost gets caught three times before she’s even 50 miles out of town. 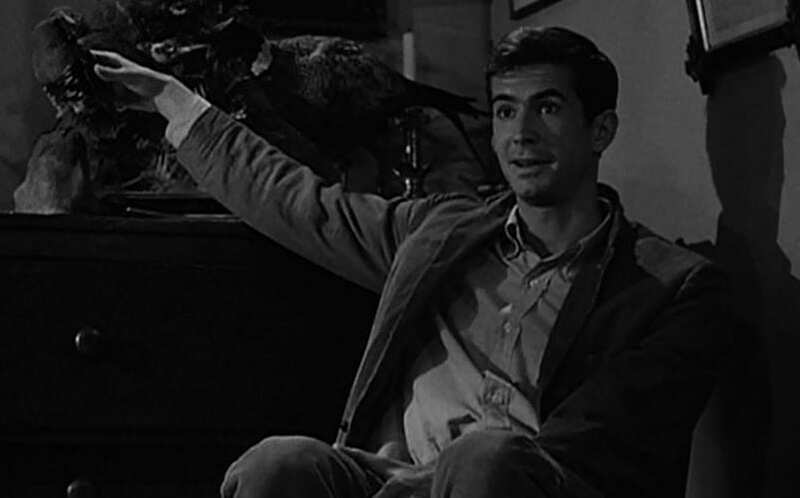 Marion finds her way to the Bates Motel and meets its owner, Norman (Anthony Perkins). Norman lets Marion know that the motel is completely vacant — which she doesn’t take as a bad sign, for some reason — and shows her to her room. Then Marion gets to overhear Norman having a shouting match with his mom so loudly that Marion can listen in from down the hill. Psycho could really alternately be titled Mommy Issues: The Movie. When Norman comes back, him and Marion have a long chat while she eats her dinner. It’s a pretty sweet conversation, at first. They just talk about his entirely wholesome hobby of making bird taxidermy, where she’s from, and how Norman loves his mother. Things get a little more uncomfortable when they start talking about how his mother is completely nuts. Marion is surprisingly cool and polite through this whole creepy conversation, considering how un-cool she was when she was trying to be a criminal. At the end of it she excuses herself and heads into her room to shower and get ready for bed. As we all know, she doesn’t survive the shower. We all know the shower scene, but the clips always leave out the most horrifying part of it, which is the way that the camera lingers on Marion’s dead face afterwards. Brr. The rest of the movie plays out as a mix of horror and mystery, as Marion’s sister and boyfriend investigate her disappearance. The mystery sections are long enough to lull you into a sense of false security, because this movie is SCARY. As soon as any of the people investigating the murder arrive at the Bates Motel you immediately fear for their lives. There are lots of disturbing twists to be uncovered, and they’re revealed with a masterful sense of pacing. This is a film by Alfred Hitchcock, so the amazing pacing isn’t surprising, but the screenplay can take some of the credit. Joseph Stefano adapted the screenplay from Robert Block’s novel and put together some really great dialogue. The script is so witty I laughed at the film more than once, even as the tension was mounting. The twists are also very well delivered. You’re given so many false leads that it’s difficult to figure out what’s going on until the very end. The characters are completely believable and well-rounded, and complimented by stellar acting. Janet Leigh gives a great performance as Marion in this movie, but the star is Anthony Perkins. Norman Bates is unsettling in a way that makes it very clear that something is wrong, but manages to be sympathetic too, especially in scenes with Marion. Perkins has such control over his face, and conveys his emotions with a subtle turn of his lips or crinkling of his eyes. It’s also a brilliant casting choice just because Perkins is so damn handsome. He’s sitting there talking about how he loves gutting, stuffing and embalming birds for fun, and you’re like “aww, that’s nice” because you’re taken off-guard by his looks. Considering that Hitchcock has an incredible eye for filmmaking, I’m surprised to say that this is absolutely the least interesting horror movie I’ve seen so far in terms of camera work. Although shots are frequently taken from odd angles, it’s relatively plain to look at. To its credit, I’ve watched a lot of recent releases so far, and there’s more technique and technology available to modern filmmakers. Even then, given what was available at the time, I have to assume it’s intentional. The film relies much more on strong shadows in the lighting to create an atmosphere. It gets the job done, and might even be better off for it, but it isn’t the eye candy that It Follows is. I also have to mention the most famous part of Psycho — its music! Literally everybody has heard these shrieking string instruments. It may as well be considered the official theme song of stabbing. It’s a great piece of music. I think it might actually be underrated, somehow. It’s used more than once in the film, and when it starts playing you react totally by instinct. All you need to get scared is to hear the opening notes of the piece! The second time it started playing I actually jumped in my seat. Psycho might not look as attractive as its modern horror counterparts, but it tells an outstanding story and is genuinely terrifying. It has an amazing pedigree and completely lives up to it. If you haven’t seen it recently, it’s worth a re-watch. There’s a lot to enjoy here. I’m slightly concerned I won’t be able to find a film that could top it. In the interest of trying to find something better, next Saturday I’m following a reader’s suggestion and reviewing The Babadook. I am told that it takes what Goodnight, Mommy does right and doesn’t ruin it with gratuitous violence. Sounds promising! If you want me to review your favorite horror movie, just send me a message on Twitter (@NoemiPOM) or comment below, and — I will! Simple as that.